Summer is in the air, and there is a lot to be thankful for as the school year comes to a close! The school year at The Beach School was sprinkled with lots of projects. The year kicked off with the new Hand Washing Station where the kids were taught about the importance of hygiene and health before eating. It was a great success and important moment for these delightful little ones! After hands were cleaned, it was time to start eating! Our Hot Lunch Program was quite a success as the kids were able to stay nourished for a productive school year! We were very excited about this accomplishment. Lady Salami started off with a few little chickens and turkeys at the beginning of the school year, and wow, did they grow! She is looking forward to using their eggs as extra nourishment for the kids during the next school year. In September, when it’s time for school to start again, it won’t just be eggs that these kids will be enjoying, but also fresh vegetables from their garden that was constructed this past school year. The garden has sweet potatoes, soybeans, and casaba growing plentifully! 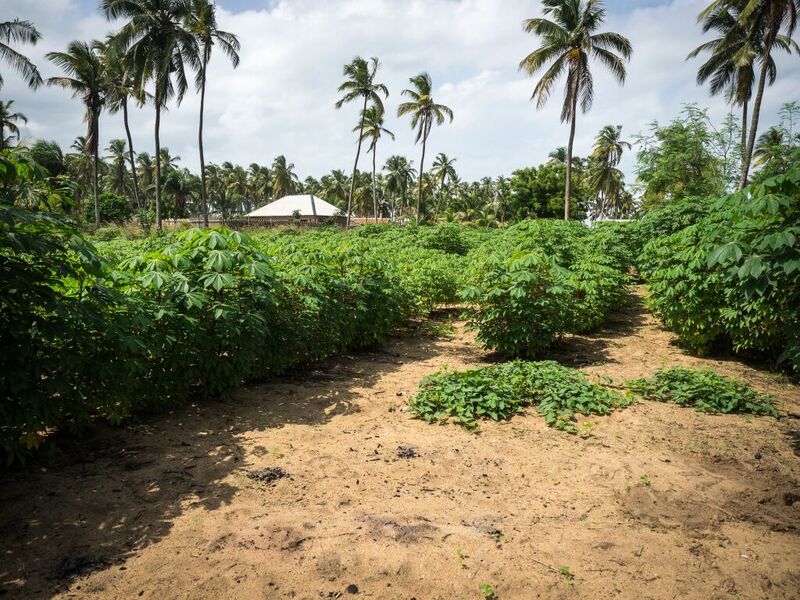 Due to all of the hard work and dedication, the future is looking prosperous and full of nutritious, yummy food for these kids! In regards to self-sustainability, growing a garden and raising animals weren’t the only things that these kids learned! 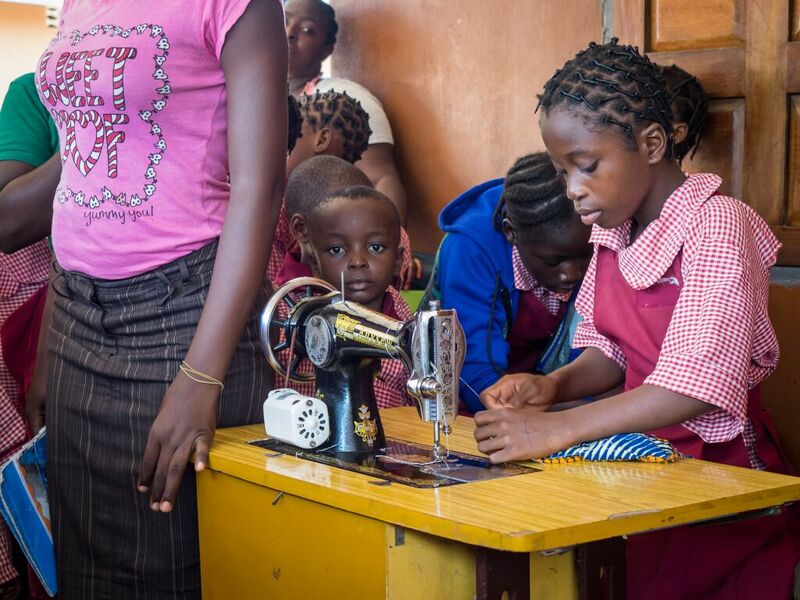 Some teachers started teaching the kids how to sew and make clothes of their own! 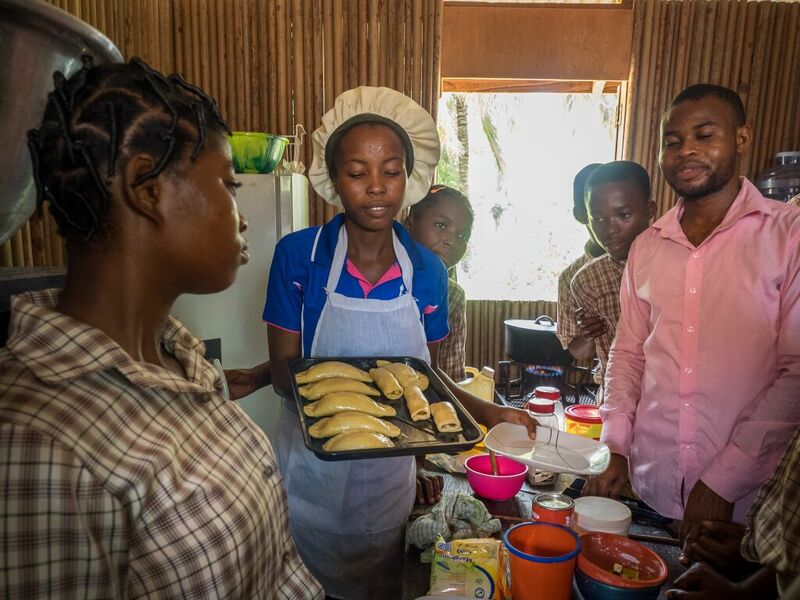 Some of the older children also learned how to cook a few things in the new kitchen. Many life skills were taught to these children within the past school year, which is always a blessing in the environment in which they are growing up. Between their education in the classroom and their life skills, these kids prove to be an unstoppable force in the future! The library was arranged to help the kids better navigate through their favorite books and it was also a great success. The children constantly remained eager to have our volunteers read to them! It was a wonderful time when we could sit down and narrate the stories that these children love. While the kids enjoyed books, the teachers were enjoying a new place to sit! We provided every teacher with a new chair, built by a local carpenter, this year. Each teacher now has a comfortable place to grade papers, read to students, or give a lesson. Smiles floated around on every face! Though the school year is drawing to a close, that doesn’t mean that improvements and future planning can come to a halt. Many children arrive to the school via The Beach School’s, “school boat,” which is literally a boat that takes some students to and from their homes and across the water to where The Beach School resides. The “school boat” has been used for quite some time and is thus in great need of extreme repairs before the next school year starts. We are thus currently in the works of getting everything worked out so that every child has the ongoing opportunity to enhance his or her life in the classroom. Though the kids and teachers are ready for a break, we are eager to start another school year in September with the wonderful, happy children of Ishahayi!